Conflicts quickly escalate into fights. This is an easy way to dull the feelings of depression. You want to show everyone that you aren't any one's doormat. If someone runs you off the highway, then run them down. When someone attacks, you defend yourself. That'll show them and hopefully distract you and everyone else from the emotional pain. You can't concentrate. We all feel scattered, now and then. When your depressed, it's easy to get caught up in fantasy or daydreams. So, how do you distinguish healthy daydreams from unhealthy ones? Healthy dreams involve changes in your life, that you can put in a handful of reasonable steps. Unhealthy ones, take you from rags to riches overnight. So, how does this relate to gratitude? That is a good question. When you start practicing gratitude you actually start to change your brain. 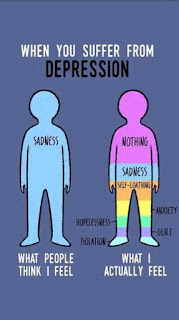 This is where the root of depression lies. Think of 25 things you're grateful for, and write them down. Tell the people in your life how much you appreciate them, and be specific about it. The good news is, that if you're depressed you can get help. Don't hesitate to reach out. Talk to a trusted friend or family member. Depression is nothing to be ashamed of, but it's also nothing to be reckoned with either. Lianne Avila is a Licensed Marriage and Family Therapist. She has helped many people with depression. For more help, please visit www.LessonsforLove.com.